Near Field Communication (NFC) is an electromagnetic wireless technology designed to enable communications between two devices. Near Field Communication or NFC is designed to communicate over very close distances. NFC was in the news in 2014 because of rumors that Apple might be including the technology in the next release of the iPhone. Google is including the technology in Android and Samsung has also included in some of their handsets. Imagine the CEO from your company slips into your elevator as it's about to close. She says, "Hi Jimmy. I was reading about NFC on one of my favorite ivory tower technology blogs. How does that work, anyway"? First things first. Don't panic. Since you are a regular reader of this section, you have a prepared an "elevator statement" about Near Field Communications. An elevator statement or elevator speech results from the scenario when you have a couple of minutes to explain or pitch something to an executive. The idea is that the elevator statement is somewhat rehearsed. The timing is critical because you only have the length of the elevator ride to cover it all. Let's get your elevator statement ready for Near Field Communication or NFC. UFC operates at 13.56 MHz and has a read and write mode as of 2013. UFC transfers at a rate up to 424 Kbits/second. UFC implements standards from ISO, ECMA, and ETSI. Sony and Phillips are leading innovators of NFC today, but the origins of the wireless standard go back to late 2003, when it was approved as an ISO/IEC standard. In 2004, Nokia, Sony, and Phillips formed the NFC Forum, which has more than 200 members including manufacturers, developers, and financial services institutions today. In 2006, the NFC Forum documented the technology and created its first road map. Several trials of the technology took place in 2007 and 2008, but it didn't really take off due to the lack of support by carriers and banks. NFC is poised to take off, as the major mobile manufacturers are including the technology in their products. As of 2011, NFC technology was more common in Asia, Japan, and Europe. However the US is starting to catch up. Two NFC cell phones can exchange data by just tapping them or bring them close together. An NFC camera device could transfer photos to an NFC equipped computer or HDTV. An NFC equipped computer could transfer data to a mobile device. Use of NFC mobile device to check out and pay at a cash register - a virtual wallet. Use of NFC mobile devices to make purchases from vending machines. An NFC mobile device can pay a parking meter. An NFC mobile device can access cash from an ATM. Use of an NFC mobile device for ticketing applications. The technology of Near Field Communication is really interesting. NFC operates in two modes. Active - Active Mode: In this mode, both devices are generating their own RF fields. This would be in the case that two mobile devices are being used to exchange data. Active - Passive Mode: In this mode, one of the devices generates the RF field and the other device uses the field to power itself and communicate. The active device is usually the "reader" and the passive device is the "tag". Once the tag responds to which signaling technology should be used, the reader will set up a communication link with all the necessary parameters. Some tags are re-writable so readers can actually update data. Consider a NFC enabled credit card. The credit card might pass along data such as a credit card number or an expiration date. An NFC equipped phone can act in an active or passive mode. 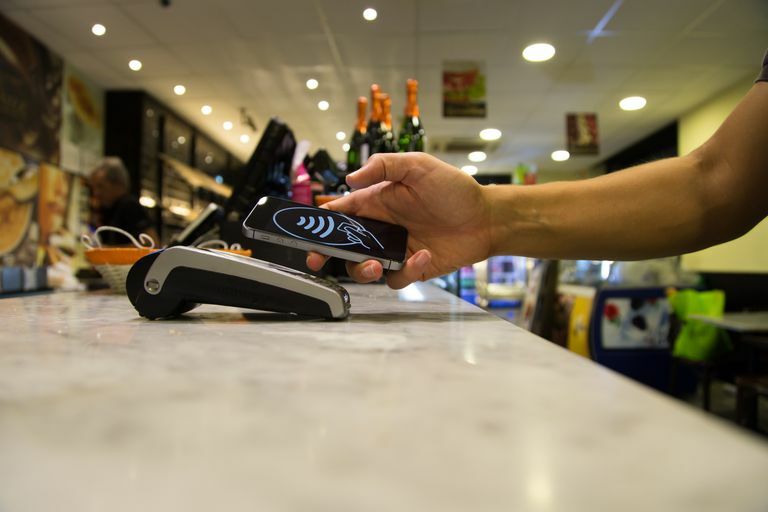 As a payment method in a retail application, the NFC equipped phone would act in the passive mode with the equipment at the check out station acting in the active mode. In another application, the NFC equipped phone might be used to scan a tag on a package to retrieve detailed data about the contents. In this case, the phone is acting in an active mode. The obvious key to the adoption of NFC technology is the creation of NFC integrated circuitry or chips. The reason for NFC being in the news recently is the growing number of manufacturers including these chips in their mobile devices. In response, the market will have to produce low cost, platform independent NFC tags for the market to grow. One of the leading commercial developers of this technology is Innovision Research & Technology from the UK, which was acquired by Broadcom Corporation. See Broadcom's press release on it's NFC tagging solution. The basic need for security is because the two devices must be within a very close proximity to function. Data between the two NFC devices connecting can be encrypted using AES standards. Encryption is not required by the standard, but would definitely be a best practice. The omission of encryption was intentional in order to make sure the technology was compatible with prior implementations of RFID. Eavesdropping is something of concern in terms of security. Theoretically, a third device could enter the picture and steal data. This is why encryption would be necessary for things such as credit card transactions. In the event that an NFC ready device is stolen, there is a risk that a credit card, for example, can be used to make purchases. The scenario of a stolen NFC ready mobile device might be prevented with the use of a passcode or password to complete the communication. Researchers are looking at ways to deal with security in credit cards and other passive devices. When it comes to the secure connection between two NFC enabled devices, encryption is the best method to protect the communication stream. So now that you know enough about Near Field Communication to ride the elevator with your CEO and explain it to him, here we go. Hi Jimmy. I was reading about NFC on one of my favorite ivory tower technology blogs. How does that work, anyway"? Near Field Communications is really interesting and will continue to mature. You know that chips are being included in all new iPhones which allows NFC to work and will drive adoption. While the technology is common in Japan and Europe in 2011, the US was slow to adopt it. Anyway, the technology allows a simple communication between two NFC enabled devices. One of the devices can even be a passive device like a label embedded with NFC technology. Your iPhone might be able to download data from your laptop, buy you lunch, or even look up our product information by waving it near an NFC ready tag or device. Imagine our products are NFC tagged and our customers can wave their iPhone near the NFC tag and retrieve product information or even deals. What do you think? Should we do a proof of concept?